Homestay International Student Accommodation believes in providing a quality personal service, which is cost effective and hassle free. Welcome at the airport + Transfers to each host family. ISA ENGLISH (15h per week): You can add also the lessons to the cultural programme. Moreover, we offer a multilingual assistance: Spanish, Italian, French, Portuguese and English. Take advantage of our experience and our extensive number of host families! ISA handle scholar groups and organizes for you all the logistics. We are an experienced accommodation provider in Ireland, we know really well the area and, for that reason, working in-situ, we can guarantee to your group an unforgettable experience. ISA organizes scholar groups from September to June. Please contact us if you need to organise a group during summer period. We organise groups in Dublin from 3 nights to the length required. Please check below what is included in our basic programme and our plus programme. Now we have included also free activities in our basic programme! Host family with full board (2 or 3 students per family): breakfast, packed lunch and dinner provided. Interactive maps: all the itinerary is fully described day per day with addresses, public transport & meeting points. It includes the basic package plus custom activities and/or English classes. We will create a programme just for you with this package. It means that we will create an activity programme based on your interests and your budget: a programme exclusively made for your group. The activities will be based on the age and interests of the group as well as your budget per person. We can add also English lessons (15h per week) to the trip plus the activities for the rest of the day if desired. It includes the basic package plus more activities tailored to your budget, your group and your needs. In this package ISA will book for you and pay in advance all the activities. We will create a document for you with the schedule of the activities and itinerary to follow, all very detailed to make your stay the most comfortable and easiest without any hassle. Interactive maps will be provided where will be shown how to get to the host families to a meeting point and to each attraction. The first day your group will be heading Dublin by plane and ISA team will be on arrivals to welcome you. Once all the group is together we will go to the coach which will be waiting outside waiting for us. We will go to the meeting point where the host families will be waiting for you; each student will be allocated with its family, and they will go to their houses to leave the baggage. They will have lunch with their families and after lunch will go to Dublin. All the group will meet in Dublin city centre and head to the National Botanic Garden where they will discover an oasis of calm and beauty. 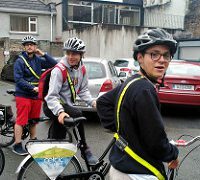 After a good breakfast, the students will leave the family house to head to Dublin city centre. During the morning, they will visit the emblematic Phoenix Park (the largest urban park in Europe) where the students can take photos with the wild deers living in the park! Enjoy your packed lunch in the park and head to the city. The students will walk through the Liffey River to the Trinity College. Time to go home and enjoy your dinner with the family! The third day the students will visit in the morning the National Gallery of Ireland which houses the Irish national collection of Irish and European art. After lunch, the students will go to visit the Dublin Castle and the emblematic Grafton St where they will have time for shopping and to visit the lovely Stephen’s Green park. After all these activities, the group will head to their host families to have dinner. It’s time for the last breakfast and to say goodbye to the city. The group will head to Dublin for the last visit and will go to visit Henry St, the half penny bridge and Temple Bar. Time for lunch and to head to the coach. *Note this is a sample based for a group staying 5 days. The arrival is on a morning at the weekend and the departure is in the evening of a weekday. We will give you the activities to do for free but you will need to adjust to your group schedule and arrival/departure times. Junior groups must be full board if they are not attending a school which provides lunch. About arrival and departure, do you require transfers? Yes, I need a coach that bring the students to the host families. No, I will book my own transfers. If you book your own transfers, you will only be charged with a welcome fee. ISA team will be in the airport to receive your group until each student is with their families. It means we will provide your students with a topped-up public transport card, so they won't have to worry during their stay of buying and topping up leap cards.